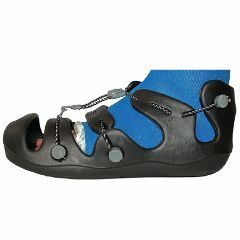 A unique bungee closure system lets the shoe conform nicely to the cast and offers easy application and removal. The modern design appeals to all wearers, and doesn’t draw attention to the cast. Constructed of durable, flexible closed cell TPR, the shoe stands up to rugged wear in any weather.An aggressive sole pattern adds stability for the patient while ambulating. The closed TPR Footbed provides comfort while ambulating and protects exposed toes. Latex free. Durable. easy fit. easy to adjust. This runs big! My son's cast, heel to toe, was 11 inches and the small was too big!!!! But, this was far more durable than the cheapie walking shoe the hospital gave us that we went through 2 of before I broke down and bought this. It was so worth the purchase! Slip resistant. Comfortable. ease of use. looks sporty!. lacing not interconnected. toe protection not adequa.